Access to talent and capital are the two largest challenges that startup companies face. 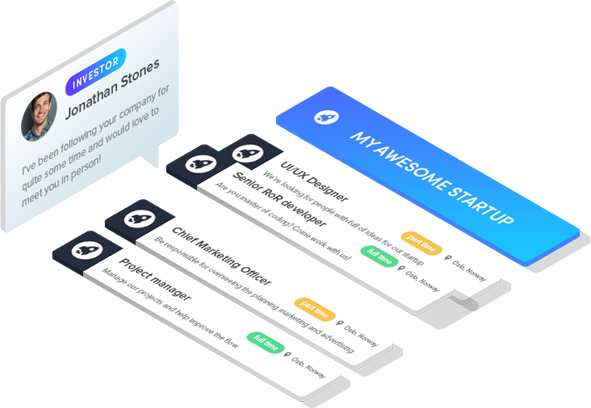 More than 3000 startups are recruiting top talent and connecting with startup-keen investors on Startupmatcher to scale and grow their businesses. Get started in minutes! Tell the world about your startup. Add your team members and showcase your product or service. Post jobs or contact candidates directly and sell them on why they should work with you. Receive meeting requests or send meeting requests to investors in one click. Chat to arrange your meeting. Posting jobs is free, hiring is free, connecting with investors is free, reaching out to candidates is free. Hire top talent or obtain funding without emptying your pockets. Reach 25 000 active and passive candidates looking for startup opportunities. Our talent pool includes software engineers, designers, growth experts, and much more. Get access to more than 500 top level investors with startup track records. Secure funding from someone that is passionate about your field and that can provide more than just capital.